WPForms 1.5.1 has just been released and we know you’re going to love it. 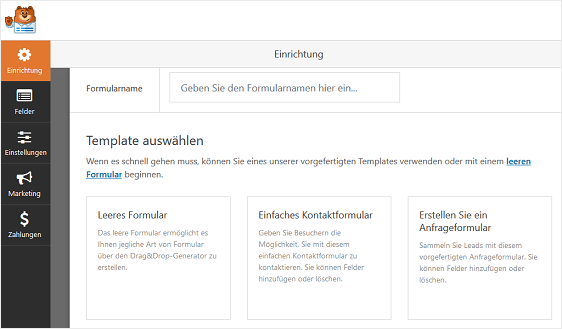 There are several features packed into this release that make form creation even easier than it already is. Plus, it’s going to help you increase form conversions and make more money, which is what every small business owner wants right? So, let’s see what WPForms 1.5.1 has in store for you! Have you ever used WPForms and wished it had a feature, only to find out it was there all along? That can be frustrating and make you feel like you’re not getting the most out of a product you’ve paid for. Luckily, we’ve created a way for you to know what features are available, while in the form builder itself. 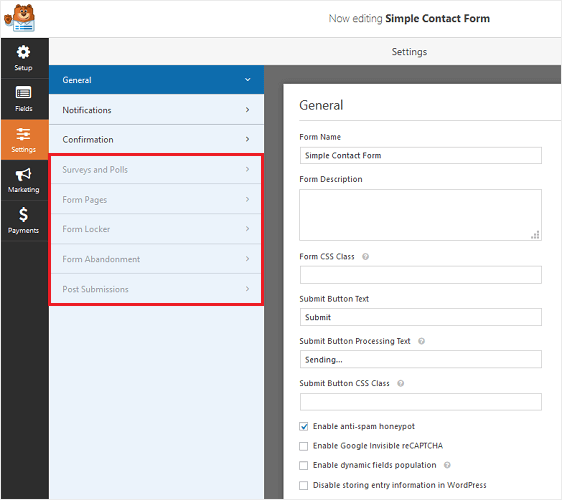 And to make things even easier on you (which may not seem possible at this point) we’ve created a way for you to install and activate any WPForms addon without ever leaving the form builder. Anytime you’re configuring your form’s settings, and you come across a feature you’re not actively using, it will appear grayed out in the form builder. This is our way of telling you that you aren’t using one of WPForms’ awesome features. If you decide you want to use a feature that’s not enabled, just click on it. You’ll see a popup asking you if want to activate it. All you have to do is click “Yes, Activate” and that feature will be ready to use on your forms. And guess what? The same thing happens when you’re adding form fields to your form. Want to add a Likert Scale to your form? No problem. 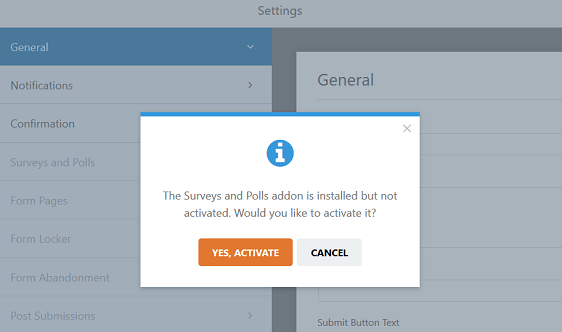 Click on the grayed out form field, install and activate the Surveys and Polls addon, and add a Likert Scale to your form within seconds. Our hope is that by adding form building education to our plugin, you’ll discover features you never knew existed, save yourself time and prevent errors, and feel confident that WPForms is the best investment you could have made for your small business. Right now, English is the number one used language on the internet. But that doesn’t mean there aren’t other popular languages being used on the web too. Some website owners prefer to use WordPress in their native language. But the problem is, if your site’s plugins aren’t translated, that means they’re still in English. This creates inconsistencies across your site’s interface and makes site creation harder than it needs to be. Don’t see your native language? Don’t worry, we’re going to continue our efforts to increase WPForms’ global presence and offer more language translations throughout the year, so be on the lookout! One of your most requested payment features is finally here: payment checkboxes! Up until now, if you wanted to give people the option to choose more than one purchase item, you’ve had to add multiple form fields to your order form. But did you know that removing as little as one form field has the potential to increase form conversions by as much as 26%? Do away with cluttered, lengthy, and complicated order forms by using our newest form field instead. With it, you can give your customers the option to choose more than one purchase item at a time – from one form field. Plus, you can increase form completions, improve your customers’ buying experience, and make more money. And don’t forget, the less form fields you have to add to your order form, the less work you have to do. Check out our newest release and let us know what you think about the new features we’ve included. As always, thank you for your continued support of WPForms, and we look forward to helping you create better online forms. P.S. Don’t have a WPForms Pro license? Click here to get started today and experience the WPForms difference. It would be awesome if you guys could add sliders! Totally I’d love to see sliders also I’m seeing them more and more on websites. I think a neat feature would be to track via cookies what pages the user visited (that the form is shown on) and passing it as a variable on submit.